This article was updated by the author in February 2016. The original version of this article appeared in the Summer 2011 issue of PBO and was reprinted in the Essential Maintenance Guide in the summer of 2012. In February 2016 enough of the data, references and sources has changed to make it worth updating. Keeping batteries topped up is an ongoing problem for boat owners. Is it enough to run the engine from time to time and put up with the huge inefficiency, effects on long term engine performance and growls from your neighbours, or should you fit an independent means of charging the battery, such as a wind generator or solar panel? Solar panels are an increasingly popular option, not just in the Med’ but also around the coasts of the UK as the price comes down and down. But choosing them can seem a bit of a black art: after all, how can you possibly predict how much sun you’re going to get during the season, or how much power your panel will produce if it’s not exactly aligned with the sun? But provided you accept a statistical approach using established databases then prediction is easier than you think. 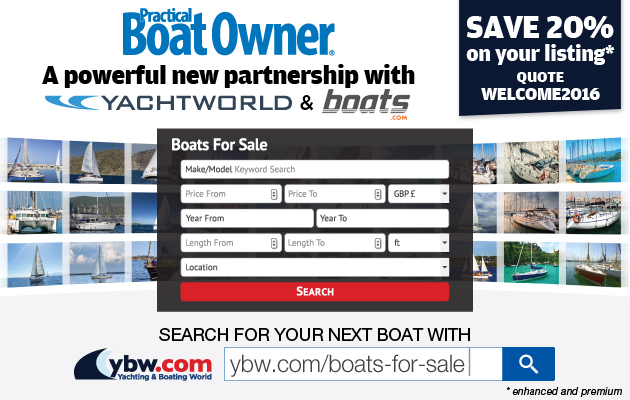 The first step is to work out your boat’s power requirements. All you have to do is add up all the energy in Watt-hours used by each device on your boat, such as the fridge, lights, computers and so on. Energy is power accrued over time so if power is measured in Watts, energy is Watt-hours. Most of these devices will have a badge which will tell you what the power requirements are in Watts, so you just multiply this number by the number of hours per day the device is actually working. When making your estimates, remember that the fridge will work harder when the sun is out and the temperature gets up. Once you have your energy requirements worked out I suggest you add a goodly margin for expansion and errors –at least 10%. There’s a worked example at the end of this article. Next, you need to decide how much of this requirement should be met by the solar panels. We sail our Moody 33 Aderyn Glas throughout the summer season from our base in Preveza, Greece, so our requirements are essentially those of liveaboard sailors –we want the panels to be able to supply most of our power needs and allow us not to have to ruin the peace of a quiet anchorage by running the engine just for charging, while weekend sailors might be content with a small panel adequate to recharge, over the course of a week, the energy used during a day’s sailing. Getting the balance right is important, especially if you’re looking to install enough solar panels to more or less cover your power requirements. To do this you will need to calculate how much power you can reasonably expect to get from your panels over 24 hours –more of this later –and ensure that the panels are powerful enough to supply your complete power requirements in the daytime, plus have enough capacity to charge the battery by the amount it has been depleted overnight. If you underestimate this you will end up having to run the engine to top up the batteries every so often; overestimate and the solar panel’s regulator will be throwing power away. But will you get the quoted Wattage from your panel? If the panel is a 100W panel will you get 100W? Panels are rated as the electrical power produced under certain strict test conditions and these are: solar irradiation (called: insolation) of 1000W/m^2 at 25C and an atmosphere of a particular clarity. Do we ever get these conditions in practice? Well yes we do but life is never that simple and later I’ll explain about how to assess the real insolation over the course of a day in your chosen location. A hypothetical energy balance. 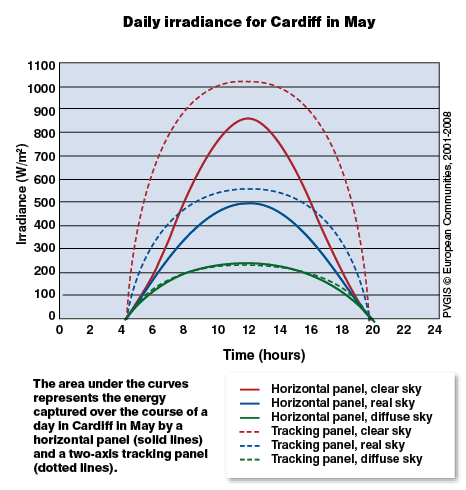 The red line is the clear-sky power that the panel could provide during daylight. The blue line is the power your boat requires. Light blue is surplus energy where the panel is outputting more than the load and dark blue is where the load is greater than the panel can deliver. When night falls the boat’s energy needs have to be met by the battery. In daylight the battery becomes a load for the panels as it is charged. The green line is a notional illustration of the state of the battery; it winds downwards when there’s a shortfall and upwards when there’s a surplus available for charging. In winter the load profile will be different and the captured power will be lower. What kind of panel should I fit? There is now a whole taxonomy of solar panels comprising three generations and various species within each generation. The academic drive is to make panels that are more environmentally friendly, both to make and to dispose of, and to reduce the cost per Watt. But this has resulted in a much poorer conversion efficiency (the amount of electrical power you get per Watt of solar power in) which is not helpful to sailors with a small area available to mount the panels. Because of this let’s eliminate from this discussion the third generation organic panels however creditable the motives for developing them. Similarly, second generation Amorphous panels have, in my opinion, little to recommend them: although they are cheaper to manufacture the cost per Watt by the time time they sit on the shelf in the shop is two or three times the cost per Watt of the first generation crystalline panels. Their only obvious advantage is their tolerance to shading. So back to the first generation: crystalline panels come in mono- or poly-crystalline species but they only differ slightly in cost per Watt and efficiency. Added to the mix is the flexibility aspect, flexible panels require a bit of clever manufacture and this is passed on in higher prices. If you want a little more detail on the three generations of panel read my article in PBO January 2015, which is available from the reprint service. So does this mean the default starting point for any installation is a rigid, crystalline panel? In short: yes! What are the costs? This is a quick survey carried out in November 2015 across a small number of reputable suppliers. Two things leapt out at me when I did this: firstly if you use panels destined for household solar energy installations their cost is really low, below £1/Watt so it would be feasible to outfit your yacht with these and if the frames eventually get corroded earlier than you might hope you could afford to ditch them and replace them. Their output voltage is typically around 30V so you need a regulator which will handle that voltage but I shall seriously look at these as replacements when I eventually need them. Secondly, in general I was surprised at just how much the cost of panels has fallen since the original of this article was published in PBO Summer 2011, and how much choice of manufacturer there now is. Here are a few pointers but shop around and you’ll probably be able to beat these numbers. The table is sorted by £/Watt. So you see what I mean when I say the question is all about how much space you have, the default option should be a crystalline panel because it has the best Watt per unit area coupled with price per Watt and we only need to deviate from this simple first generation solution if other factors are important. Amorphous panels need four times the area per Watt than crystalline ones and cost about twice as much per Watt and when you go flexible the cost spiral upwards exponentially. Amorphous panels are made by depositing silicon onto a substrate. This process is cheap and allows flexible panels to be made relatively easily, but large areas are needed to generate much power. This effectively puts the price up. However, amorphous panels are tolerant to low light levels, so can be a good choice. Polycrystalline (or multicrystalline) panels use small pieces of silicon fused together, making panels look like they are made from metal flakes. They work well in unobstructed sunlight, but if even one of the silicon cells is shaded the others try to feed power into it, dramatically reducing the overall efficiency of the panel. Semi-flexible panels are commonly available, which offer enough curvature to fit a coachroof, for example. Monocrystalline panels panels use large individual pieces of silicon for each cell. They are generally now the cheapest solution and the default point to start from when planning an installation. Semiflexible panels are available, but are rare owing to the fragility of the single crystals. They are just as affected by shade as polycrystalline panels. Where should I put my panels? If you’re just fitting a small panel to top up batteries on a mooring buy a cheap rigid panel and find places on your boat where you can tilt it to catch the sun’s rays for the majority of the day. We do this during the winter in Greece where we strap an old 15W amorphous panel to the coachroof and it works well for us. It’s not heavy and a crystalline panel would be smaller and thus lighter. Choose a spot that isn’t shaded for the majority of the day and this technique should serve you well. Do the sums. I have heard of people whose batteries have been damaged by a constant high power being applied to an already charged battery even through a regulator. My rule of thumb for trickle charging is a panel Wattage about 10% of the battery’s stated Amp-hours –but anyone else’s guess is just as good. If you spend more time on board and need to get the best from your panels, mono- or polycrystalline panels will give more power from the same space –we replaced our 75W bank of amorphous panels with 200W of monocrystalline panels in the same area. But with higher efficiency comes higher sensitivity to poor mounting conditions, so if you want the best from your panels you need to do your utmost to ensure they are not shaded, and also that they are tilted as close to a right-angle to the sun as possible. For this reason, liveaboards usually mount theirs on gantries at the stern or on the pushpit. Once you’ve totted up the energy in Watt-hours you need to provide to keep the beer cool and the tablet charged, provided enough spare for you crew’s pedicure set and hair drier and looked around your boat to find a suitable mounting site which is close to the battery bank but completely free of shade, you effectively have a set of criteria that you would like your installation to meet. Now it’s time to look at the limitations of the technology, and see how close a match you can get to your required performance. Let me just revisit this: the relationship between the nominal power of a solar panel and what you really get. When the manufacturer quotes, for example, 100W for a panel, that is the expected output under test conditions. The test conditions are an insolation of 1,000W per square metre at 25°C. So if you get a sunny day that insolates your 100W panel at 1kW/m^2 then you have the potential to get 100W output for a short time around solar noon. But the energy over 24 hours will be below this owing to the declination of the sun over the course of the day. This can be partly remedied with a tracking panel, but as the sun declines the light has to pass at a more oblique angle through the atmosphere, hence losing power. The insolation will also be affected by your latitude, and by any form of shading or scattering from atmospheric dust, haze or cloud. There is a tolerance on the nominal value quoted. I’ve seen figures of +/-3% from one manufacturer and +5% from another (which is good, of course). Over life the panel output will decay. A crystalline panel will lose about 10% in 10 years. Losses in cables are proportional to the square of the current. The equation is P=R*I^2 where I is the current in Amps, R is the resistance in Ohms and P is the power in Watts. The voltage gradient from the high voltage at the panels to the lower one at the regulator is fixed by the cable resistance and current (Ohm’s law), which is in turn set by how sunny it is and the power required, but the resistance is a matter of design. To minimise cable losses (and prevent potential overheating cable problems) large core cables are needed. Resistance is also proportional to the length of the cable, so long cables need to be even fatter than short ones. Of all the possible ways to lose power from a panel this is the most important. On a crystalline panel even the stripe of a rope’s shadow can wipe out a huge amount of the potential output power. We’ve had situations where the shadow of our neighbour’s mast in port has robbed us of most of the power we could have achieved, and we’ve even had to move our ensign from the backstay because it’s fluttering shadow took the power output down. Why is this? The individual cells in a crystalline panel are wired in such a way that a cell which is in shadow and not producing will act as a sink for the power produced by the other cells it’s wired to with the result that virtually no power escapes from the panels as a whole. So a shadow that covers perhaps 10% of the panel might be enough to zero it’s output completely. In contrast the more expensive amorphous panels will lose only perhaps 10% of their output, which, as I’ve said elsewhere, is their only advantage. The rating from the manufacturer is quoted as the best possible output irrespective of the voltage needed to get that output. As a typical example you might find a 120W panel delivers 7.1A at 16.9V thus giving 120W. But to use this power you have to be able to operate at 16.9V. There are regulators that do this (see MPPT types, below) and these are becoming more accessible to thrifty sailors as time passes. When I wrote the first version of this article in 2011 I recommended that since MPPT regulators were so expensive it would be better to spend the money on slightly larger panels but with the change in pricing of regulators and panels this is not such a clear cut option and now I would suggest using an MPPT regulator such as a Victron 75/15 which can be bought for under £100 rather than the older PWM type. The PWM regulator needs to operate at about 15V input to give the required 14.4V output and at 15V the panel suffers a power loss compared to the maximum power point of around 10% to 33%. The job of the regulator is to throw power away. It does this to ensure the power passing on to the batteries or services is not too great for them to handle. Normally it does this by controlling the amount of power passing through it to hold the output voltage at some predetermined value such as the float charge voltage of 13.8V. 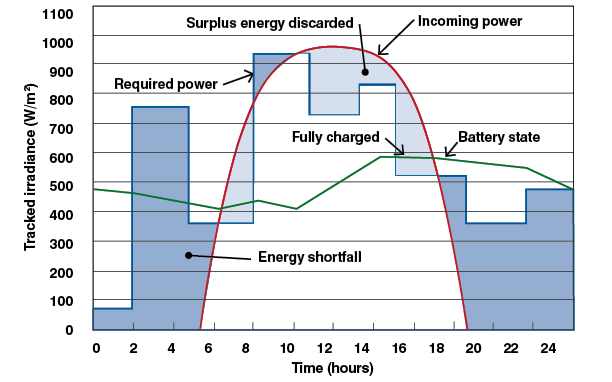 The value of the power it passes depends on the current required by the load: the sum of batteries, lights, fridge and so on that are sucking the current from the panels. If the fridge is on, for example, more power will flow through the regulator and it will throw less power away as heat. Most common, older regulators use a pulse width modulation (PWM) system which is more efficient than simply controlling the output voltage. Maximum power point tracking (MPPT) devices provide more usable power by seeking the panel’s optimum power voltage and in recent times the cost of these devices has fallen dramatically so that they are now worth serious consideration. I investigated the effect of fitting one of these to Aderyn Glas and my report was published in PBO January 2015. To the solar panel the regulator is part of the load –a consumer of power –which is why the entry to the regulator is an appropriate place to measure the voltage and current if you want to see exactly how much is being generated by the panels. How much power do I really get from my solar panel? MPPT regulator. As the panel gets older its performance will drop off even more. All a bit depressing, isn’t it? I have to say, though, that in our particular installation on Aderyn Glas the output is better than theory would suggest. 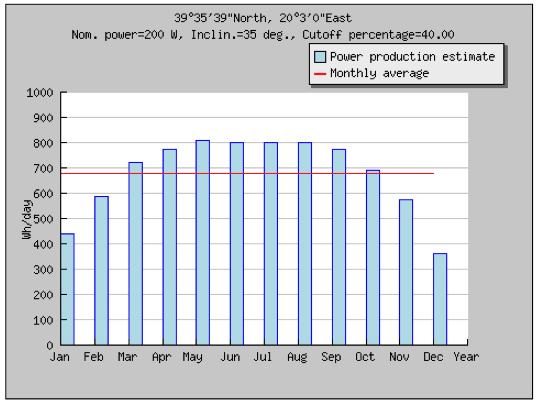 We regularly get more than 10A from our 200W panels, and our highest recorded value was 170W, which suggests that these loss figures are conservative. The reality seems to be that with a well set-up installation, you can expect to get a maximum of 75% of the power you would expect from a continuously insolated panel operating at its rated power. Irradiance – how much power is reaching me? The sun is 93 million miles away, give or take. Packets of energy called photons leave it and travel at 186,000 miles per second just to fall on us and keep us supplied with energy. If you held up a solar panel outside our atmosphere, it would be irradiated by broad spectrum sunlight at 1,370 W/m^2; this is called insolation. Because the Earth is tilted on its axis we see more of the sun in the summer than the winter; in the winter it just about creeps above the horizon and the stream of photons has to travel through a far longer atmospheric path than when it is overhead in the summer. 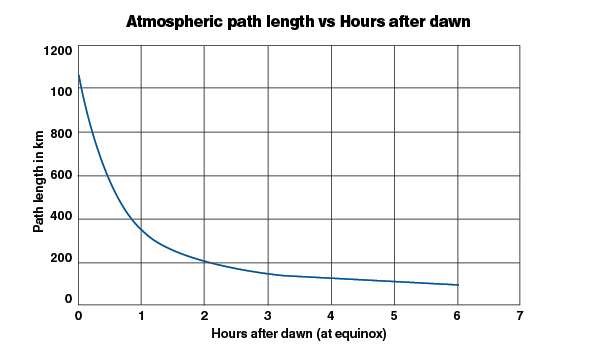 The atmospheric path length also changes from dawn to dusk – it’s 11 times longer at sunrise or sunset than it is at noon. The longer the path length, the more of the sun’s energy is lost by atmospheric absorption and through scattering. Latitude is the other great influencing factor. If you were sat at the north or south pole the atmospheric path length would be almost constantly 11 times as long as the path length above someone sitting on the equator. A useful mathematical model is available here. Light has to travel much further through the atmosphere when the sun is on the horizon. This is a purely geometrical effect; the actual energy lost will depend on the clarity of the atmosphere but there is always some loss. (This graph assumes a 100km deep atmosphere and two-dimensional geometry). Insolation – or can an angled panel help me catch substantially more power? At solar noon the horizontally mounted panel performance will get as close to the panel on a tracking mount as it will ever get. However, as the sun declines the power drops off rapidly. 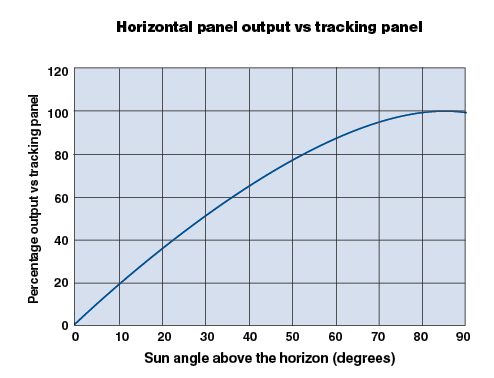 The graph (below) shows how the irradiance of a horizontal panel varies as a percentage of the irradiance of a tracking panel. I mounted the panels on Aderyn Glas on a tilting mount so that I could track the sun in elevation but not in azimuth. 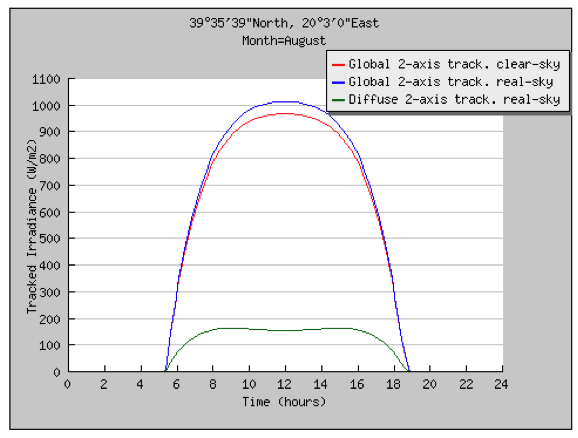 This is a compromise: if you cruise a particular latitude and can tilt your panels to the optimum angle for your latitude and track the sun in azimuth from east to west you will get much more from your panels. Suitable mounts such as the Altazimuth two-axis mount are available, but it may be better to spend your money buying bigger panels and settling for a more modest mounting arrangement. We just try to swing Aderyn Glas to track in azimuth – but of course we can’t always do so. An alternative is to mount your panels at a fixed angle so that they are permanently tilted and do not track the sun at all. Again, this is better than a horizontal panel and is the technique used by solar panel ‘farms’in places like Spain. It’s most useful if you tend to sail in a constant latitude, since the optimum tilt angle is latitude dependent. 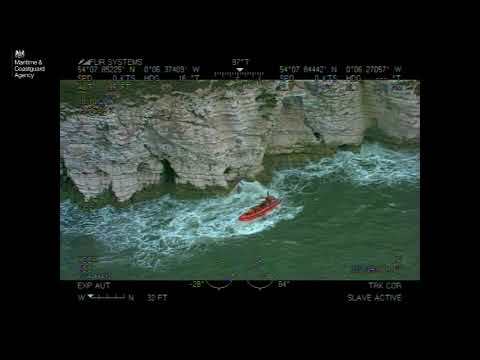 If you choose to do this, consider whether to fix the tilt at a summer or winter position; you may decide that there is little need for winter energy input (it’s cloudy, you rarely use the boat, there’s plenty of shore power available) and so you will set the angle for summer cruising. Alternatively, you could find you have so much power available in the summer that an extra bit of free power in the winter will make you go for the winter angle. You can play with an interactive model and find the yearly optimum for yourself by following this link. When the sun is directly overhead a tracking panel and a horizontal panel will both provide the same energy. At all other points the tracking panel will have an advantage, as shown here. When the sun is at 10° above the horizon, for example, the horizontal panel will only convert about 20% of the energy available. How much sunlight can you expect? The final crucial piece of information you need to be able to scientifically specify your system is how much sunlight you can expect to receive. This might sound impossible, but in fact it’s easier than you think, thanks to some handy scientific data published online. In the PBO January 2015 article I had a look at the European Joint Research Centre’s method of calculating insolation for chosen months and chosen locations worldwide. Their home page is here: https://ec.europa.eu/jrc/ and well worth a visit. How can I find the maximum I am likely to get out of my panels? Most people want to know this either to check their installation or to plan the size and number of panels to install. These days there are a number of web-based calculators available to help, one of these is provided by the European Commission Joint Research Centre (JRC) here: http://re.jrc.ec.europa.eu/pvgis/apps4/pvest.php#. I was interested in finding out how much my nominal 200 Watt installation of crystalline panels should deliver in my chosen cruising area of Corfu in the summer months and then see if I could work back to estimate the efficiency of the installation taking in to account the panels, regulator, wiring and general losses, in other words ‘from sunshine to battery’. The first thing I did on the webpage was choose the location, so using the map, zoom controls and mouse I navigated into the middle of the Corfu channel. I chose a sea area because the system has data on horizons and if I had selected, say, Gouvia Marina it would have shut off the virtual sun as it sank below the virtual mountains. Next I selected the Daily Radiation tab and filled in some data. The database is the best around so I left it at SAF PVGIS, this is where all the accumulated data for recent years is stored. 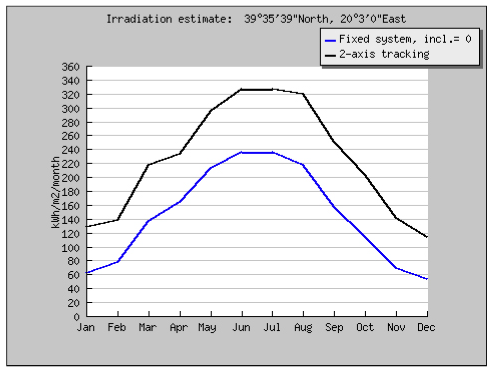 I wanted data for August and I wanted average and clear sky insolation (irradiation) so I clicked those boxes. Average takes account of any cloudy days using the accumulated data. Clear sky is blue sky every day from dawn to dusk. I also wanted to compare horizontally mounted and fixed panels with those on a tilting mount so I entered zero degrees for inclination to produce horizontal panel results. On a boat azimuth is difficult to control so I let orientation stay at zero; due south but I selected two-axis tracking to produce a maximum for comparison. The first obvious difference between horizontal and tracking installations is the peak power output is less if you can’t tilt the panel. This is because the sun is never exactly overhead in Corfu so they can’t be equal. Secondly the shapes of the curves are different with the tracking installation being much fatter. This is the result of being able to capture energy when the sun is low, try comparing the values at the edges of the curves, say, 7 a.m.
200 W * 1010 W/m2 / 1000 W/m2 = 202 WattThe result for a horizontal panel returns 181 Watt. Unfortunately for my master plan catching the greatest current going into the batteries is like trying to photograph a dolphin; by the time you’ve seen it, it’s gone. The current depends on the load more than the source so maximum currents are likely to occur when the battery charge is low and that means in the morning, but the sun is not at its peak then. The best I’ve seen to date is 13.1 Amps at 13.4 Volts giving me 170 Watts and an overall system performance of 170 / 200 * 100% = 85% which represents a system loss of 15%. In other words 85% of the theoretical electrical output from the panel reaches my battery which is pretty good. The total area under the curve represents the energy collected in a typical day and I wanted to quantify the difference between a fixed horizontal panel and a tilting one. This was fairly simple. 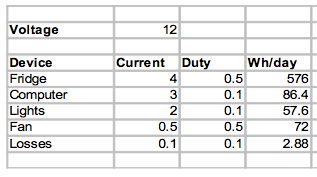 I went to the PV estimation tab and filled in the blanks leaving the JRC estimate of system losses at 14% and entering my 0.2 kW solar panels. I entered zero for the angle to generate a horizontal panel output and also selected two-axis tracking since this was the comparison I wanted to make. 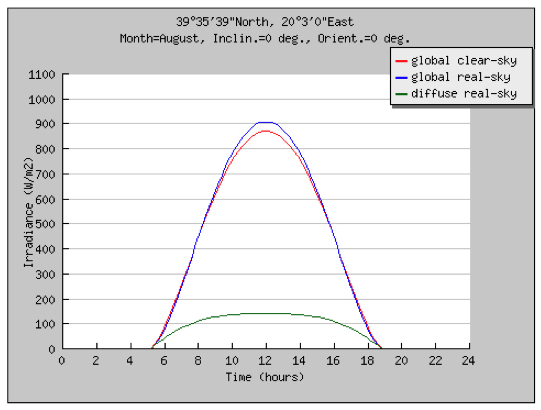 The result is pretty graphic: you gain a minimum of 33% more energy if you can follow the sun; much more in winter. Will your installation keep the batteries charged? I determined the current of each major device (usually given on a placard somewhere) then estimated the maximum duty cycle, which is the amount of time the device is actually running. Multiplying current by the battery voltage gives Watts, then multiplying by 24 hours and the duty gives the daily energy use for each device in Watt-hrs / day. I summed all the values and fed the result into the box on the website. For me this came to 800 W/day so would my 200W panels keep up? The blue bars show the energy produced and these reach the target value of 800 Wh/day throughout the cruising months of the summer. But the panels will need a bit of help from September onwards and before May. But what about closer to home? If you’re choosing solar panels, start by working out what space you have available and what your energy requirements are. Then try and find an unshaded location where you can mount rigid crystalline panels preferably on a tilting mount. Many boat owners will want to mount them on deck, in which case semi-flexible crystalline panels may seem a sensible choice but can be up to ten times as expensive as rigid panels. For tracking mounts or gantries, rigid panels will be necessary, so crystalline units will again be the best option. Amorphous panels simply don’t make sense any more, being much more expensive for much poorer performance.